My meal plan got thrown-out the window this week. With a Monday holiday and very cold weather, dinners haven't gone as planned. I utilized a lot of leftovers and baked a little more than usual. My youngest somehow ate an entire batch of brownies by himself. Luckily for me I was able to eat one before the rest went into his hollow stomach. Breakfast is still a struggle with my youngest son. He would rather eat anything, except something healthy. Oatmeal is the one breakfast food that I can almost always convince him to eat, he loves it. The only problem I have is that the steel cut oats that he loves take a long time to prep when he is hungry in the morning. 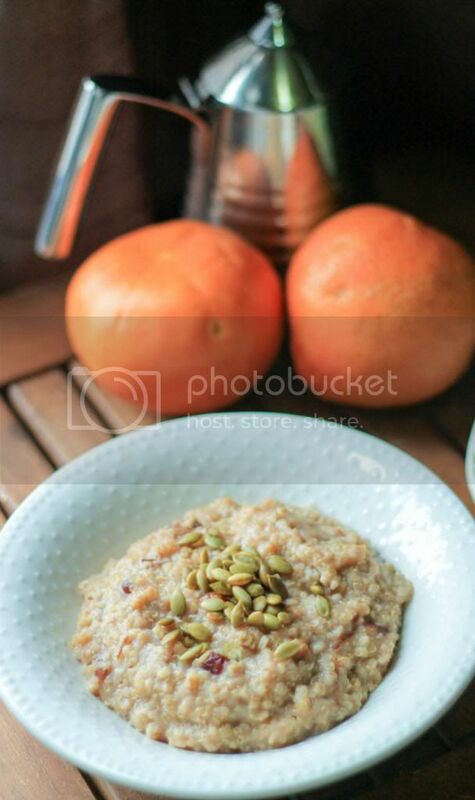 Therefore I have been trying a variety of overnight oat recipes. Last week I made a new recipe from Bon Appetit magazine for Overnight Hot Oat, Dried Cranberry and Quinoa Cereal. This recipe has 8 ingredients. It takes 10 minutes of prep, an overnight soak and then 5 minutes in the morning and makes 4 servings. I decided to double the recipe in order to have enough for everyone in my family. For the dried fruit I used dried cranberries. For the toppings I added pumpkin seeds, a small amount of vanilla and maple syrup. I have never been able to find cardamom at my local stores so I left it out. Make sure to rinse your quinoa very well. If you have never used quinoa before rinsing is a very important step. The rinsing gets rid of the bitter taste and without the rinse the quinoa will have a distinct bitter taste, that is not appetizing. Even if the brand that you buy claims that it is pre-rinsed, still rinse the quinoa again. I followed the remainder of the recipe as written. My youngest son and I both liked the idea behind this recipe. However, it needs a few changes. The taste of the quinoa was very strong. My husband wasn't a fan of the quinoa taste at all, so this recipe as written would have to be for somehow that really likes quinoa. I would suggest decreasing the amount of quinoa to 1/4 cup and increasing the steel cut oats to 3/4 cup. Adding additional fruit for sweetness might also help. The recipe suggests using barley instead of quinoa, which if you can eat gluten would be a great change and I think make the dish even better. For the recipe go to Hot Oat and Quinoa Cereal. Looks yummy! I've heard of recipes like this before but never tried one yet. I am intrigued though. Will have to to try it! I keep hearing about quinoa, but I still have yet to try it. If you rinse it first it can be great in cooking and baking. Just make sure to do the rinse or it can taste very bitter! This sounds delicious! I eat hot cranberry oatmeal nearly every morning so this would make a nice variation to that!